This is my new favourite drink. I made up a batch of it to give as Christmas gifts and I had some left over for myself. I will certainly be making this again and again all year round. It’s absolutely delicious! It’s theoretically related to Limocello the Italian lemon flavoured drink but with oranges instead. I’m currently drinking it mixed with cranberry and raspberry juice over crushed ice, or snow as available, and with a sprinkle of edible gold glitter. I think I’m calling it ‘The Northern Lights’ as the colours go deliciously swirly. I may change the name when I get a newer carton of cranberry juice as this one’s kind of a funny colour but still delicious! – First you will need to find 2 large bottles or jars to take 2.5l liquid by the end of this process and give them a good clean. I used 2 glass Italian milk bottles but obviously those are hard to come by. 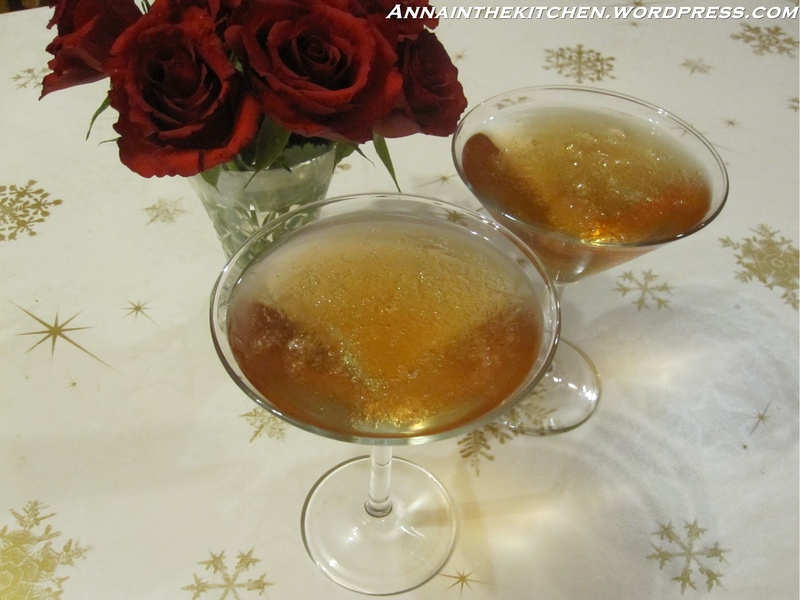 – Split the vodka between each bottle. – Peel the oranges using a vegetable peeler and be careful not to get any of the white pith along with the peel as it is very bitter. Cut into short strips and divide equally between the bottles. – Break the cinnamon stick in half and add that. – Put half the vanilla pod and 2 cardamon seeds in each bottle. – The bottles should now be about half full. Put the lids on and keep them in a dark place, shaking every day. – After a week mix together the boiling water and sugar in a large jug and stir until the sugar is dissolved. – Divide this between the two bottles. – Put the lids back on and return to the cool dark place for another week, again shaking every day. – After this week is up decant into fancy bottles, straining out the bits and pieces. 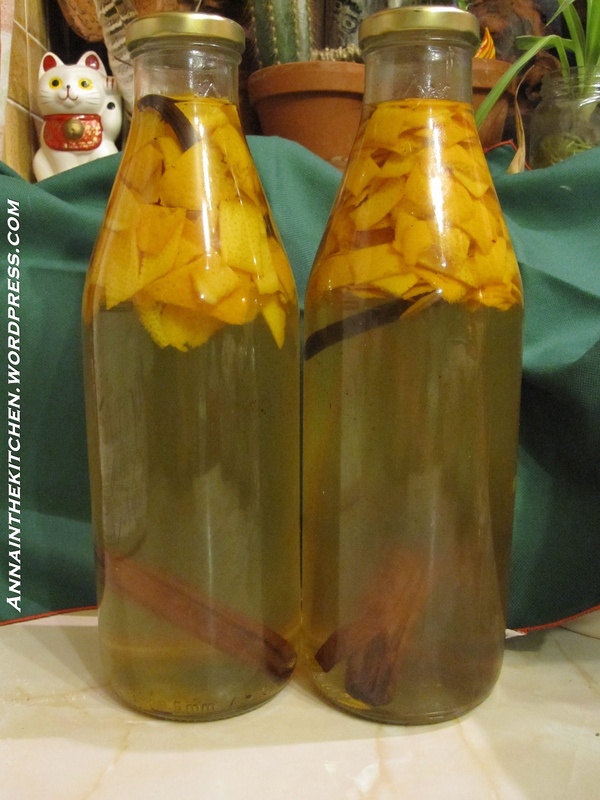 Add a strip of peel from the remaining orange and a cinnamon stick to these bottles then either store and keep for yourself or give as gifts. You can be sure the recipients will be very greatful!